Break out of your winter hibernation right here in the Finger Lakes. It may still be a bit cold and wet, but it does feel like Spring is on the way. What a great time to get out and experience history, nature and fun in Cayuga County. Witness the changes of the season outside and in! 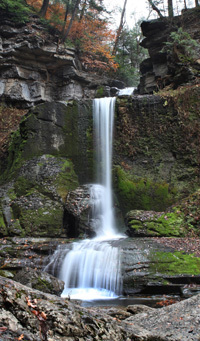 Hike to see a waterfall at Fillmore Glen in Moravia, go bird watching and see some of our eagles in Owasco, or stay inside and take a tour of the Seward House Museum. I am almost OCD checking on the progress of the Snow Drops, Winter Aconite and crocus in my yard. When they appear, I know it is Spring – or almost. I am readying my seedling pots after checking out the seeds and baby plants at Dickman Farm. This year I am re-cycling toilet paper roll by cutting them in half and filling them with potting soil as the bed for the sprouting seeds. When the seedlings are ready in May or June, I can plant the whole thing in the garden as it will just deteriorate over the summer. While walking to the Y the other morning, I heard some sparrows chirping, chirping, but could not find them. Finally, I saw one up under the gutter at the neighboring church. It does seem a bit early yet to be thinking nesting. The V’s of geese and duck are filling the sky. It is fun to try and locate the quacking flock overhead. Our local murder o f crows is really congregating in trees throughout Downtown Auburn. PBS hosted a TV show on the crows explaining how intelligent they are; how they mate for life and how they actually have different vocalizations for danger, friend and such. See if you can discern this crow language when you see them in the trees. My daughter and I are going to check out the nesting eagles at Owasco Flats at the southern end of Owasco Lake. Wear good shoes as there are walking trail along the old railroad beds. I am sure the skunk cabbage will be stinking too! Maybe we will amble on down to Moravia to check out Jenning’s Department Store and see the new exhibition on Millard Fillmore at the Cayuga-Owasco Historical Society. We might event take a hike at Fillmore Glen as the waterfalls should be putting on quite a show now. If it is too cold, you can enjoy some inside activities. 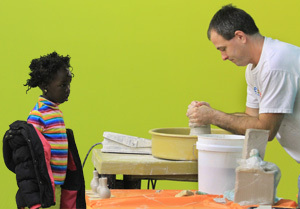 Schweinfurth Art Center will be offering “Play with Clay”, a series of classes for kids during the week-long Art Camp and will participate in First Friday, a community-wide free evening, by offering contemporary folk music by Lindsey Tidd. You can view the current exhibition, Made in New York, an annual juried exhibition featuring work by artists residing in NYS, for free. Over at the Seward House Museum, The Civil War Program Series honoring the sesquicentennial of the Civil War will launch on April 6 from 6 – 8 pm with “The Photography of Conflict”. Professor of Visual Studies at Cornell University, Shirley Samuels, and photographic process historian, Mark Osterman of the Eastman House Museum, will give presentations on the social history of photography during the Civil War Era. Cost is $15 and seating is limited: reservations are required. Visitors are encouraged to bring their own photographs from that period for discussion, and stay for a reception following the lecture with light hors d’oeuvres. A little history. A little nature. A lot of fun. It is all here in Cayuga County.